Upper Valais consists of the present German speaking part of Valais and extends from the river Furka to the river Raspille (Sierre). The Celts (Uberer, Seduner, Veragerer and Natuaten) colonised Valais originally whereas in today’s German part the Uberer were situated. Around 40 AD today’s Valais was suppressed by the Romans and became a Roman province with Roman civil rights. This was due to its traffic wise importance (Summus Peonius, Grosser St. Bernhard). Since 443, Valais was colonised by the Burgunder who made up only one third of the population, though. Hence they adopted the Roman (franco-provencial) language and culture. 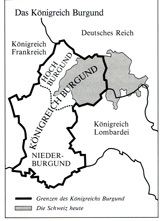 The Valais remained in the Burgundy kingdom until 999. Historically, the colonisation of Upper Valais is rather uncertain. Linguistic scientists date the emigration between the 8th and 9th century and also the origin can be determined almost only linguistically. Where from did the Alemanni immigrate? In this question, the scholars do not agree. Some say they infilitrated over the river Grimsel into the Goms to gradually move downstream. Others try to prove that the Alemanni immigrated over the river Gemmi or the Lötschenpass to move up the valley. It is a fact that the immigrated Alemanni in Goms came from Haslital. 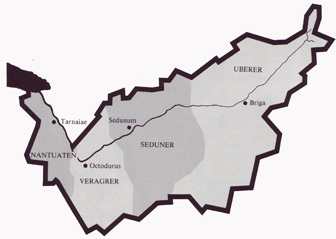 In the upper Rhonetal various villages can be found whose names end with the syllable –ingen: Ulrichen (Uolrighingen), Reckingen, Gluringen, Selkingen, Blitzingen. This syllable identifies a settler group’s affiliation to the founder of the village or the landlord. So originally, Reckingen means “clanship of the Recko”. But the Goms’ names build the natural continuation of the –ingen –chain of the Bernese Oberland. This chain ends with Meringen in Haslital. The immigration over the river Gemmi or the Lötschenpass it harder to prove. 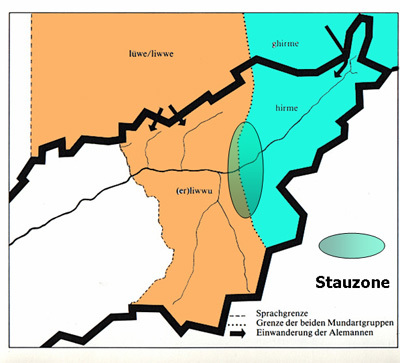 The Valais-German is not consistent as it contains two groups of dialect. The word spring, for example means üstag in the western Upper Valais and langsi in the eastern part. Below Brig, the word liwwu is used and above Brig hirme. Lüwe/liwwe is common north of the Lötschenpass and ghirme across the river Grimsel. This argues for two routes of immigration. The Alemanni population grew so strongly in the 13th century that they were cramped for space in Upper Valais. An expansion eastwards was not possible because of the strong Romans (Ducal Savoy) therefore they migrated over the eastern and southern cols into the neighbouring high-lying valleys (migration of the Walser). Sources: Walliser Geschichte, volume 1+2, Arthur Fibicher; Die Walser published by IVfW; internet. Time line, Wikipedia and Schweizer Geschichte.